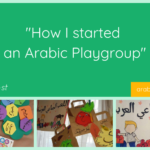 In April, I gladly collaborated with Umm Layla from “Layla’s Classroom” to create a FREE Bird-themed Pack in Arabic and English. She also shared a tutorial to make Bird Watching Binoculars with your kids. The activity pack includes: a bird journal, basic bird parts identification in English and Arabic, six common bird cards with accompanying video file (children can match the sound of the bird with the correct picture), general bird information in English and Arabic. Read the Binoculars Tutorial & grab your Arabic-English Freebie here!